We started this project in 2003, our first sailing boat was an Oceanis 311 called “Sur”. We rented it with or without crew. “Sur” was in Garrucha (Almería) during the low season (October-April). Temperatature and weather is great in Almeria during these monthst. Using Garrucha as basis we went to Cabo de Gata, Carboneras, Cala de San Pedro with its typical hippy stands, Rodalquilar, La Cala del Plomo, las Negras, San José, Monsul, Los Genoveses . And if the Eastern wind blew, we anchored just at the other side of the cape. When May arrived, we set the couse to the Pitihuas. Ibiza and Formentera awake and recover their seamanship activity. Our activity was and is focused in the Ibiza’s Club Náutico. During 2011 we decided to grow in length, and before “Sur“ grew older, we changed to “Caph” a Jeanneau SO 40.9. 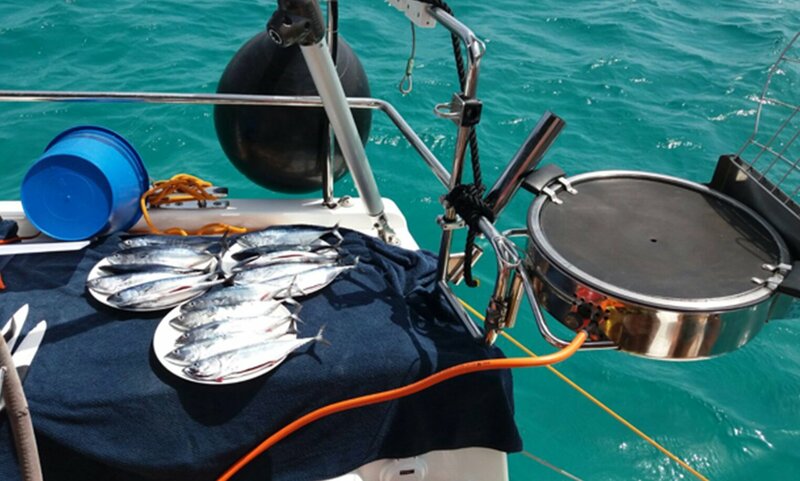 But our target didn’t change: keep ou boat in perfect shape, with the best equipment, and so let our customers enjoy it during low season and also in high season from Ibiza and Formentera. For the low season we picked Águilas (Murcia), next to Garrucha. Having our headquarter in Aguilas allows our boat to be used as school-ship for the Formarítima y Nautione, navigation schools. The newly entitled PERs, Skippers and Captain carry out their practice period in our boats. But we didn’t forget the Cabo de Gata and Mazarrón, Cala Cerrada, La Azohía y Cartagena routes, because the climate there is also splendid. Águilas has, among other advantages, the possibility of anchoring in some of its many coves, thus allowing short time trips. During February the Carnival races brighten up the coldest period. And Garrucha is always at hand, as the distance is 16 NM, and only three houres to reach the harbour. “Caph” gave us many happy houres, and we will never forget early May 2014, when we went to Saïdía (Marroco) . The harbour installations are firt class, and distance is not a hindarance to enjoy 3-4 days saling along its appealing coast, very near to Melilla, where we also spent a day. “Caph” worked perfectly in Ibiza and Formentera el during May and June, with one day charters, and in July and August, with full week trips. September and October were full of shortes charters. During a trip from Ibiza to Aguilas, ( October 2016) we received a call and an offer to buy “Caph”. We hesitated, but we were already thinking of enlargening length again, so we decided to sell it. Late in 2016, we contacted the German dockyard Hanse, and there we bought the “Ariel” a Hanse 505, 16,3 meters length. We were invited to visit their premises, and there we went, Northern Gemany, near to the Polish border, in Greifswald. We saw them jointing our “Ariel” in their top headquarters. It came by road in April, 2017, towards Barcelona. Sailing from the Baltic sea to the Mediterranean seamed too expensived. “Ariel” started sailing in May 17th, touring Ibiza and Formentera, and so it continues presently. After hard experimentation years, to discover the best boat, length and equipment, we have reached our objective : “Ariel” is perfect for sailing in their coves. This Hanse 505 has perfect balance between the comfort of a luxury cruise liner and the nimbly navigation. Toñi is the head of our adminitrative staff, reservation, special requests, and all other prcedures are her risponsability. Jesús, still loves sailing, supervision is his strongness. Vero, the best of Cordoba’s simpathy, is in charge of the skueaky cleanness on board. Based in Ibiza’s Nautic Cllub, sheets, towels, laundery and dry cleaning is her scope of activity. Adolfo, teaching in the nuatic school, professional PPER captian will be at your side during sailing, his knowledge of wind, coves, sea… is astonishing, perhaps as a consequence of his long experiece …With him at your side, your sailing habilities will improve, he will teach you basic fishing, where the best place to practice snorkel is, where best parties take place, best paellas in some secret places… in summary, all you need. Your privicy is safe with him. His cabin, with independent entry is located in the bow. He will never disturb you. We have a team that has everything ready and a sailing bout for you to enjoy the best holidays in the clean water of Ibiza and Formentera.